Magyar Posta is issuing a commemorative stamp to mark the European Judo championships to be held in Budapest between 25 and 28 April 2013. 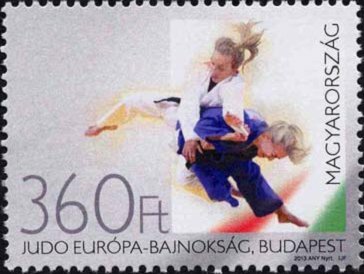 One hundred thousand copies of the stamp depicting female judokas with a face value of HUF 360 designed by Tamás Záhonyi and Iulian Pena (artists of the International Judo Federation) were made by the ANY Security Printing Company. The European Judo Championships are being staged for the fifty-third time. On this occasion almost five hundred men and women from forty-three countries will compete in fourteen categories at the Papp László Sports Arena in Budapest. The event is enlivened by an exhibition of the Hungarian Judo Museum showing the history of the sport in Hungary and its greatest achievements. At the closing ceremony on 28 April 2013 Hungary will hand over the baton to France, the organisers of the 2014 European Judo Championships. Jigoro Kano (1860-1938) created the martial art known as Judo in 1882, and attained the rank of twelfth dan, awarded only to the originator of the sport. He recognised that it was not possible to live in modern Japan in the spirit of the ancient Samurai, but saw a need for sports that taught very strict discipline and allowed youngsters to try their strength without danger. In Japan the history of Judo as a martial art dates back many centuries. Originally, the martial arts encompassed the full repertoire of the military techniques of the ancient Samurai, including training in all aspects of combat from throwing to swordsmanship. When he fashioned the discipline known as Judo from the martial arts, all techniques that endangered physical well-being were omitted, creating a sport suitable for children and adults. Judo is a physical contact sport in which the opponent is thrown to the ground, tripped, held on the ground or rendered harmless by applying leverage and holding. Judo has been an Olympic sport since 1964.